A G8 meeting, at which Russia was represented by Prime Minister Dmitry Medvedev, was held in an informal setting at the US President’s Camp David residence, away from the city hustle and bustle. To lend the latest G8 summit an informal nature, its host, U.S. President Barack Obama, decided not to meet his guests in his hometown of Chicago, but rather to bring them to the U.S. presidential retreat in Maryland known as Camp David. Not all the participants adapted to the casual setting; French President Francois Hollande, making his G8 was his debut, wore a tie during the working lunch. Russia was represented by Prime Minister Dmitry Medvedev, standing in for President Vladimir Putin, who bowed out citing responsibilities forming a new government. The G8 meeting began with a working lunch on Friday that focused on global security, in particular the situation in Syria and Iran’s nuclear program. After the discussion, the U.S. hastened to announce that there was a broad consensus among the G8 leaders on both issues. “The Russians largely stand with us in the negotiations. We have strong unity on this matter, and not only with Russia,” U.S. media cited a high-ranking official as saying. On Syria, the press claimed that the Medvedev agreed that there should be a political process in the country that would meet the needs of the Syrian people. Russian special envoy to Africa Mikhail Margelov confirmed that the G8 has a common position on Iran: “Nobody wants Iran to have a nuclear bomb,” Margelov said. The question is how to prevent Tehran from becoming a member of the nuclear club. “There are no differences over Iran, unlike with the Syrian issue,” Margelov said. The approaches still differ, but Russia’s position remains unchanged. There can be no violent regime change in Syria, and the Syrians should sort out their internal affairs themselves. “You cannot use an axe to hack your way through the Syrian crisis, you have to use a pair of pincers to somehow sort it out,” said the envoy. For Syria, peaceful settlement was declared the preferred option. The G8 supports the plan proposed by UN special representative Kofi Annan, Obama said. North Korea also got its share of attention. The G8 leaders, the U.S. President said, recognized that the country was violating its international nuclear security obligations. On the second day of the summit, the G8 leaders turned to the global economy, which is still showing symptoms of crisis. 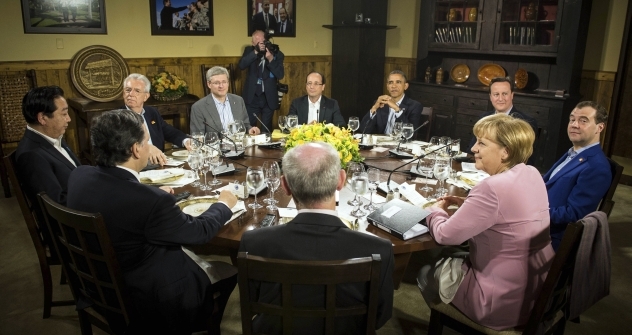 It had been a long time since the G8 devoted close attention to the topic, leaving it in recent years to the G20. The return of economic issues to the G8 agenda does not mean that it has lost trust in the G20, however, according to the Russian prime minister. In a statement on the global economy, the G8 reaffirmed the importance of a strong Eurozone for global stability and recovery and supported the Eurozone leaders’ resolve to address the strains in a credible and timely manner, and in a manner that fosters confidence, stability and growth. “We commit to fiscal responsibility and, in this context, we support sound and sustainable fiscal consolidation policies that take into account countries’ evolving economic conditions,” read a statement issued by the G8 leaders. The G8 did not discuss concrete financial assistance to troubled European countries. This will be the subject of discussion at the G20 summit in Mexico. Dvorkovich recalled that Russia, as before, intended to channel its assistance through the International Monetary Fund. However, Moscow did send a signal to Europe. “The prime minister said we are not going to reduce the share of the Euro in our reserves, lest we send wrong signals on the situation in Europe,” said Russia’s G20 sherpa, Stanislav Voskresensky. Unlike specific measures with regard to Greece, the G8 easily agreed on how to help Arab countries in the wake of the revolutionary changes there. In addition to various bilateral and multilateral financial support initiatives, they agreed to establish a fund to work with the regional partners, the World Bank and regional institutions such as the Islamic Development Bank, to create an initial fund with a capitalization of $250 million, the White House announced. Finally, on the foreign policy agenda, the discussion turned to Afghanistan. The world’s leading democracies confirmed that they will not leave Afghanistan without support. The G8 leaders declared their intention to take measures to relieve economic pressures during the transition period and support Afghanistan’s economic development by raising its fiscal revenue potential and improving the expenditure management system. The fact that Dmitry Medvedev filled in for Vladimir Putin at the summit did not affect bilateral contacts with the leaders of other countries. Medvedev’s one-on-one talk with Obama took place in keeping with the informal spirit of Camp David – on a bench, without ties and jackets. “We spoke again about what has been accomplished in recent years,” Medvedev said, giving his impressions of the talk. “I said that my presence here as the head of the Russian delegation could be considered as a definite symbol of succession in our foreign policies, succession in reset.” Medvedev’s presence at Camp David, he stressed, means that he and Putin share a vision of Russia’s foreign policy. Medvedev also passed on a letter from Putin to Obama, setting forth positions in certain areas of Russia’s foreign policy and bilateral relations with the United States. Medvedev also met individually with many of the G8 leaders during the two-day summit. With German Chancellor Angela Merkel and Italian Prime Minister Mario Monti, the talks focused on the Eurozone. They discussed not only Greece, but also other European countries that are experiencing difficulties, including Spain. The Russian prime minister summed up the results of Camp David in a meeting with British Prime Minister David Cameron, who took the opportunity to invite Medvedev to the London Olympics this summer. The Russian prime minister took note of the invitation, but chose not to reply just yet.